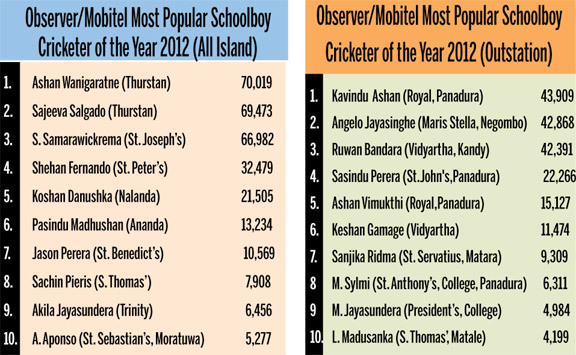 At the end of count Number 20 of the Sunday Observer/Mobitel Most Popular Schoolboy Cricketer competition. In the Outstation category, Royal Panadura’s Kavindu Ashan Perera took the top spot with 43,909 votes after occupying the number 3 spot last week. He has gone ahead of Vidyartha’s Ruwan Bandara (42,391) and Angelo Jayasinghe of Maris Stella, Negombo (42,868).